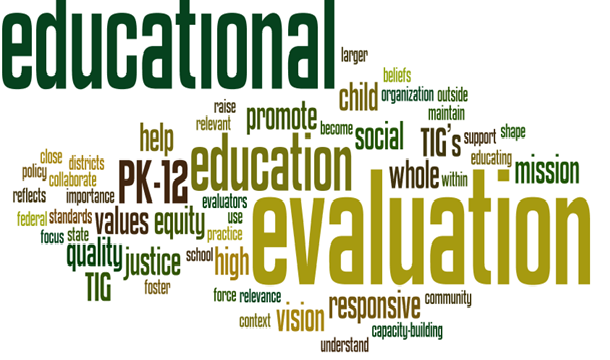 Welcome to the PreK-12 Educational Evaluation TIG Web page. Below you will see our mission statement along with current announcements that are relevant to the TIG. Facebook: Our community page is https://www.facebook.com/Prek12EdEval - however, we have migrated our conversations to our GROUP page: https://www.facebook.com/groups/907201272663363/ . Please come "join" our group as we would like to use Facebook as a supplement to our website and as a place where we can communicate with each other, share ideas and resources, and just get to know others with similar interests. Currently on the page are links to our AEA365 posts, as well as news articles related to the three most popular topics identified by the TIG from our survey: teacher evaluations; educating the whole child; and evidence-based evaluation. Anyone who visits the page is welcome to post and share other links and resources with the group. LinkedIn: Search for us on LinkedIn PreK-12 Educational Evaluation TIG This is a member "members only" group so please send a request to join in order to see the content. TIG Email. We now have a Gmail account, which can be used as a general contact for all of the TIG leadership team. Please add PreK12.Ed.Eval.TIG@gmail.com to your address books! Leverage our expanded network of Members-at-Large to improve our sensitivity to the needs of our members as they provide us with requests for information. Continue to collaborate with others with similar evaluation interests, including work on mutual capacity building. Plan on sponsoring/leading Thought Leaders weeks on topics of interests of our members. Continue moving beyond organizations to networks. Move from a closed-system approach to an open system approach. The TIG leadership is interested in the development of communities of practice for Prek-12 Educational Evaluators. Click here to download to a copy of our think-tank presentation on communities of practice from Evaluation 2011 in Anaheim. Copyright © PreK-12 Educational Evaluation TIG. All rights reserved.